Rome is easily one of our favourite cities in Europe. It is absolutely stuffed full of sights, with thousands of years of history layered upon itself – you’ll find everything here from Roman ruins to Renaissance art. It’s also home to fantastic food, the Vatican City and sights like the Trevi Fountain, the Coliseum and the Spanish Steps. Certainly 3 days in Rome is not enough to see absolutely everything that the city has to offer, but it’s definitely enough to see all the highlights if you manage your time effectively. With that in mind, we wanted to share what we think is an excellent itinerary for three days in Rome, which covers the attractions that visitors to Rome are most likely going to want to visit. This covers all the major highlights for your three day visit. Following the itinerary, this post is then full of tips and advice for visiting Rome that will help you get the most out of your stay, as well as save money on attraction entry, transport and accommodation. To get the most out of your trip and to be sure you see all the major attractions, you will need to do a bit of forward planning and even reserve your entry time to the key attractions – otherwise you’ll waste your time standing in lines unnecessarily. Don’t worry though, we explain everything in this post to help you save time! Now, let’s get started with our guide to the best things to do in Rome in 3 days. Any Tours You Recommend in Rome? Where to Go After Rome? This guide to Rome is quite full, so do feel free to adjust it to meet your own interests. However it is certainly possible to do everything in this guide with 3 days in Rome. The Vatican City is the first thing on our list for your visit to Rome. It’s a country of its own, inside Rome, and is home to world-famous sites including the Vatican Museum, the Sistine Chapel, and St. Peter’s Basilica. 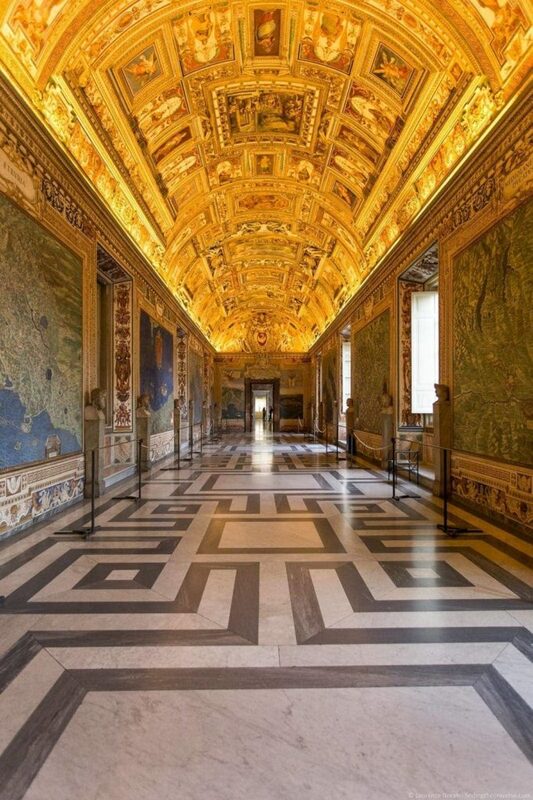 We recommend you come here early and head straight for the Vatican Museum with your skip the line ticket. We cover ways to skip the lines in Rome further on in this post, but if you purchase an Omnia Rome and Vatican pass, you will have the option to pre-book a timeslot for your skip the line entry. Another option is to book your tickets online directly from the Vatican, which will give you skip the line access to the Vatican Museums. If you plan on seeing the majority of the attractions in our itinerary this isn’t our recommended option, but we wanted to make sure you know it is an option. Doors to the Vatican Museum open at 9am, so we recommend you arrange your entry for as close to then as you can manage. The Vatican Museum gets really crowded as the day progresses, so getting here early will let you enjoy it for a while before it gets too busy. There’s loads to see in the Vatican Museums, which span 7km of exhibits, so you could spend a whole lot of time here. 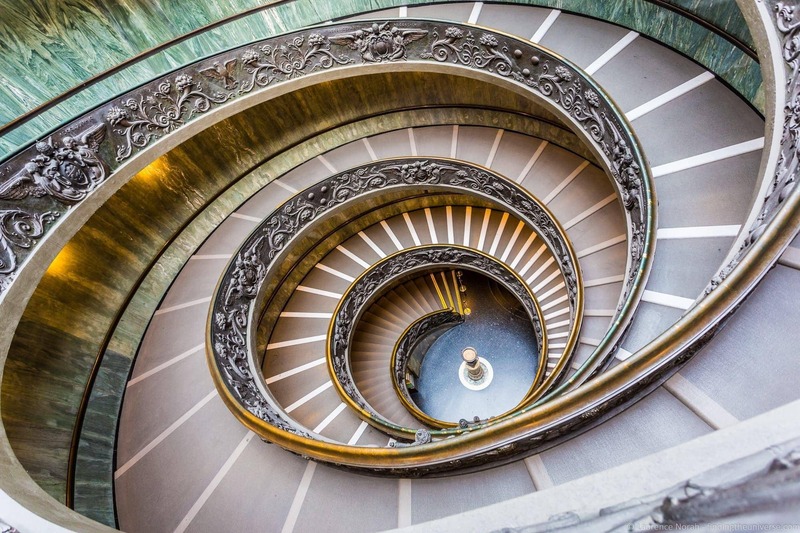 Our favourites include the Map Room, the Sistine Chapel, and the fabulous double helix exit stairwell, but we’re sure you’ll discover treasures of your own. Next, it’s back outside and on to St. Peter’s Basilica. Again, our recommendation is to have a ticket that lets you skip the line, which at busy times can stretch right around the piazza. You’ll still have to go through security, but it will be a matter of minutes rather than hours. A skip the line ticket is available with the recommend Omnia Rome & Vatican Pass, or you can book one individually online here. Once through, you’ll be able to enjoy visiting the world’s largest church, and what is regarded as one of the holiest Catholic shrines. With designers including Bramante, Raphael and Michelangelo, it’s a truly Renaissance building, and is a work of art in itself – before you even start to consider all the artworks within! If you’re up to it, we highly recommend the climb to the top of the dome. This offers superb views across the city, as well as the chance to see the Basilica from above. Originally built as a mausoleum for the Emperor Hadrian, the Castel Sant’Angelo has been sitting on the banks of the river Tiber for nearly two thousand years. In that time it has evolved from its initial role as a tomb, becoming a fortress, a castle, and finally, a museum. Today it is open to the public, and you can climb right to the top, for gorgeous views of the city. You’ll also be able to marvel at the building techniques that have allowed it to survive for two millennia. 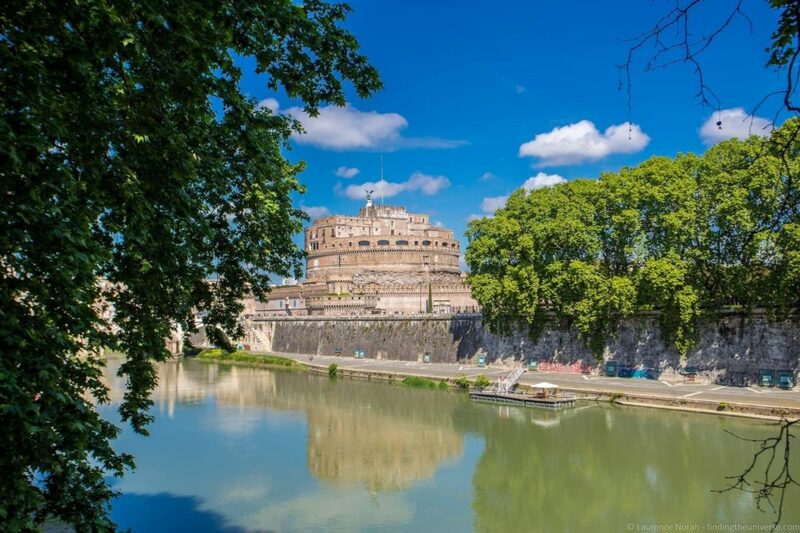 From Spring to Fall, last admission to Castel Sant’Angelo is at 6pm, for the rest of the year it is at 1pm. So as long as you are here by then you will be good for the remainder of the day as nowhere else on today’s list has a closing time. From the Castel Sant’Angelo it’s a pleasant twenty minute walk along the banks of the river Tiber to the Piazza del Popolo. This was the location of the northern gate of Rome, and is where, for countless years before trains, planes and cars, travellers would actually arrive into Rome. From here, three roads span southwards in a trident formation, with the central road, the Via del Corso, running dead straight through the centre of Rome to the Piazza Venezia. Originally this would have been the route from the northern gate of Rome to the Roman Forum. 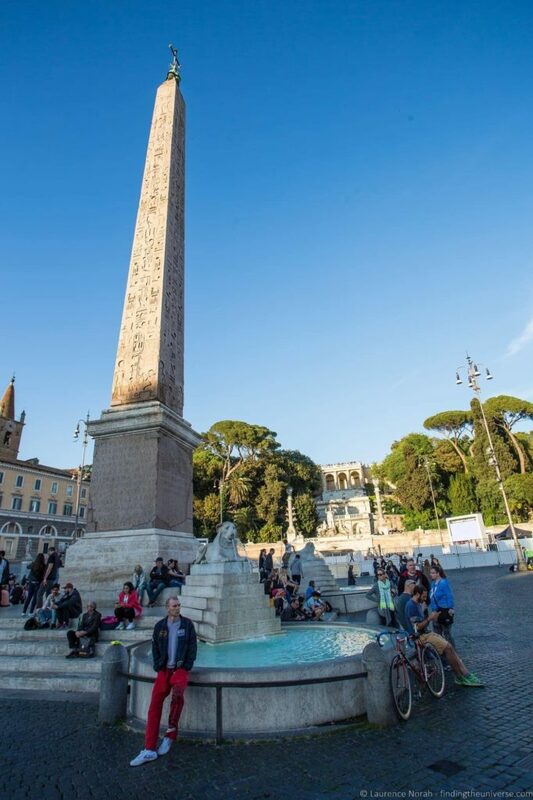 In the centre of the Piazza is an Egyptian obelisk, dating from the rule of Rameses II, which was brought to Rome in 10BC, and put in this plaza in the 16th century. On the south side of the Piazza are the twin churches of Santa Maria in Montesanto, and Santa Maria del Miracoli, sitting either side of Via Corso. We’re going to continue our first day by taking in a few of Rome’s highlights that you can take as long or as little time to visit as you wish. First on the list are the Spanish Steps. You can access these by walking in a south easterly direction through the Villa Borghese Gardens and down Viale della Trinita dei Monti. 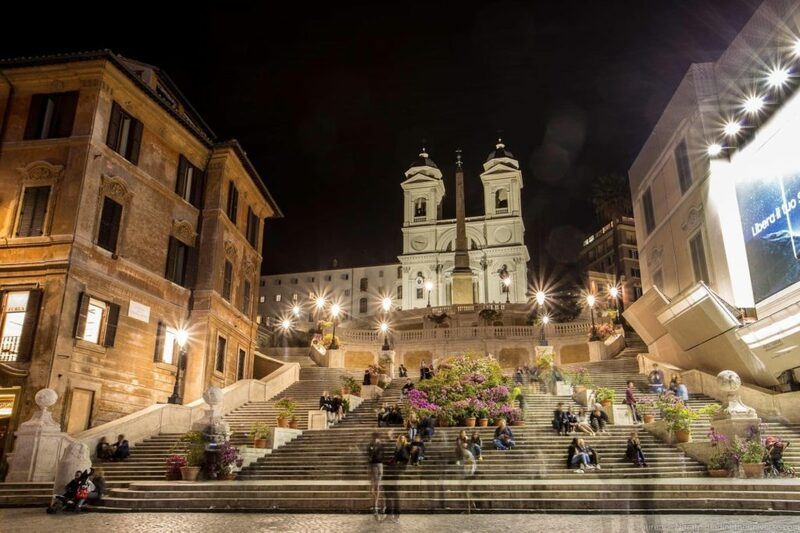 This 135 step staircase was opened in 1735 to link the Spanish Embassy near the bottom of the steps to the Trinita dei Monti staircase at the top, and are today a popular spot to stop, eat Gelato, and watch the world go by. They were made particularly popular in the 1953 movie Roman Holiday, starring Audrey Hepburn. 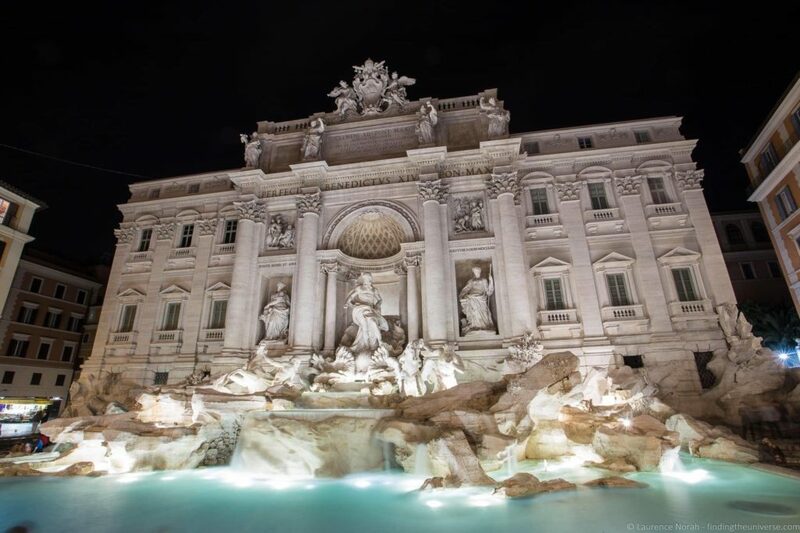 Continuing our must-visit Rome highlights, our next stop in our wanders through Rome is the Trevi Fountain. This is the world’s largest Baroque fountain, and is always a popular location – whatever time of day (or night!) you visit. Built in the early 18th century, it is said that if you throw a coin into the fountain, you are guaranteed to return to Rome. This seems to be a popular past time, as over three thousand euro’s worth of coins are throw into the fountain each day. These go to a good cause – each night the coins are removed from the fountain and used by a charity that helps those in need purchase food. A little walk from the Trevi Fountain is the incredible Pantheon. This building, which has been standing for almost 2,000 years, is the best preserved Ancient Roman monument in Rome, and I dare you not to be impressed by it’s incredible dome, which even today, two thousand years since it was built, still holds the record as the world’s largest unreinforced concrete dome. 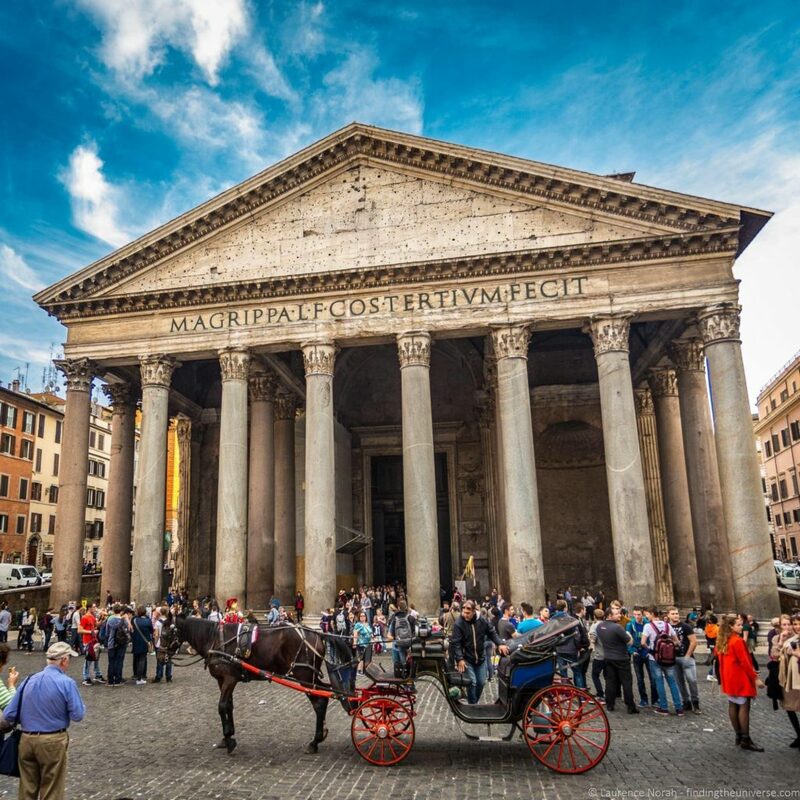 Originally built as a temple to the Roman gods, the Pantheon was converted for use as a Christian church in 609 AD, which is the main reason it survives in such excellent condition today. It’s also notable for being home to the graves of a number of important folk, including the painter Raphael and two Italian Kings. Wow, this has been a busy first day in Rome! We recommend finishing your adventure off with a visit to the Piazza Navona. This has been a designated public space since the 15th century, and is full of gorgeous Baroque architecture. 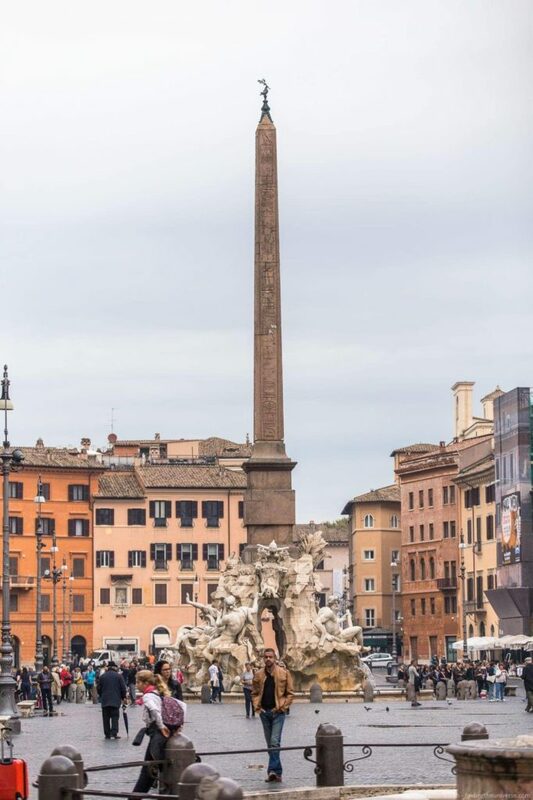 It’s most famous feature is undoubtedly Bernini’s fountain, which stands at the center – the Fountain of the Four Rivers, which dates from 1651. The Piazza is a fun place to be, and often features street performers and markets, depending on the time of day and week that you visit. There are also a lot of options here for dining and drinking as well, although bear in mind that you always pay more in Rome at the more popular locations, especially if they have a terrace or view. We ate at Caffe Domiziano, which has two seating areas. It’s cheaper to sit in the section on Corsia Agonale rather than on the main square. The food is the same, just the price is different. Now, time to rest before day two of our three day Rome itinerary! Our second day in Rome starts with another Rome highlight – the Coliseum. Built in Roman times as a space for holding public spectacles, the Coliseum is most famous for being the home of gladiators, who would battle it out in front of audiences that could number as many as 80,000 people. The Coliseum is the largest amphitheatre in the world, and despite suffering some damage in it’s two thousand years of existence, is still hugely impressive to visit. 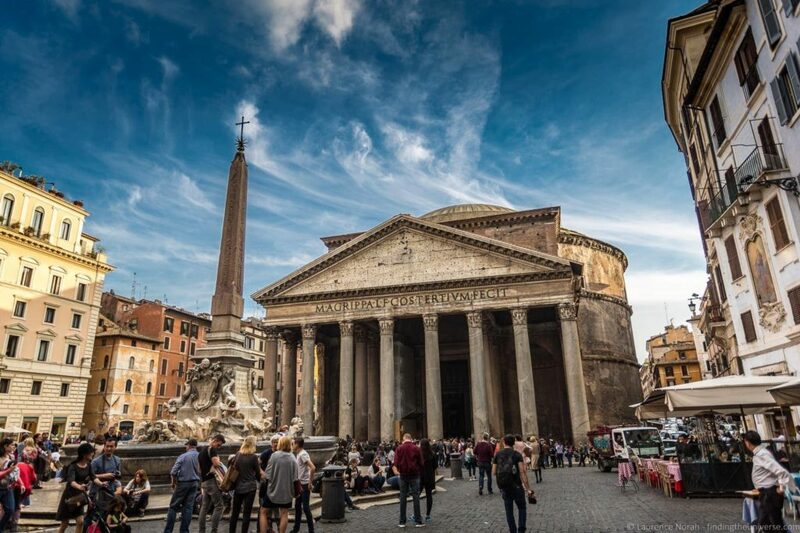 It’s one of the most popular destinations in Rome for visitors, so again, our advice is to come as early as you can, and take advantage of a pass or advance ticket purchase options so you can skip the ticket queue and go straight to the security line. Skip the line access for the Coliseum is included on the Rome and Vatican Pass, and the Roma Pass. Note that as of March 1st 2019, even with these passes, you still need to reserve your entry time to the Coliseum. You need to do this as far in advance as possible to secure the time you want. You can make the reservation either by calling the reservation line, or (more easily) by booking online. See the section later on in the post on how to do this. 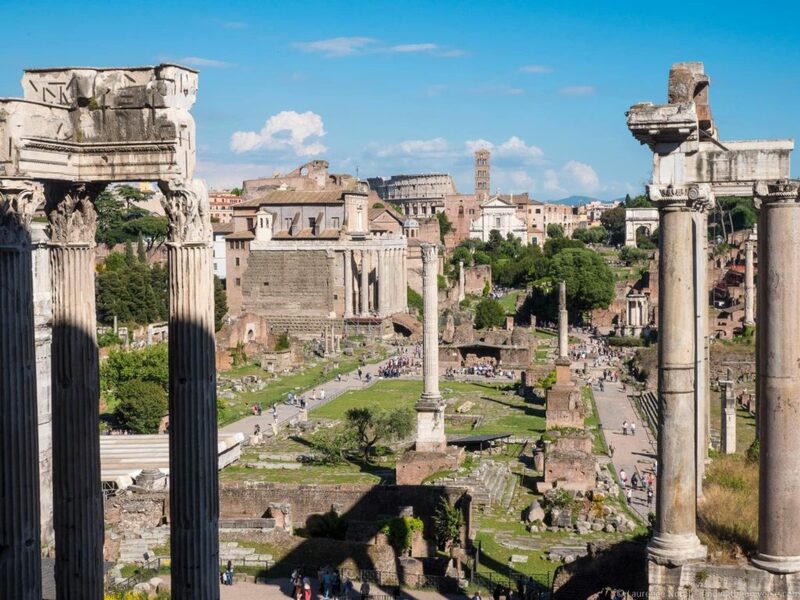 Your Coliseum ticket is also good for entry to the Roman Forum & Palatine Hill (as long as you visit on the same day), which is conveniently located right next door. If you don’t buy a ticket in advance for the Coliseum, or have a ticket with skip the line privileges, then we suggest you visit the Roman Forum first, as the queues for tickets are much shorter, and since they include the Coliseum you’ll get in faster there once you’re finished at the Forum. So what’s special about the Forum? A lot! This was the seat of power during the reign of the Roman Empire, as well as the central marketplace and business district. Basically, Roman life for centuries revolved around this area of Rome, and no visit to the city is complete without walking these ancient ruins. Time for a bit of fun! If you’ve seen the movie Roman Holiday with Audrey Hepburn, you’ll remember that Gregory Peck and Audrey Hepburn pop their hands into the mouth of this massive stone figure, which is said to bite off the hands of liars. It’s not exactly known when or how this belief originated, but the good news is that you too can visit the Mouth of Truth, or Bocca del Verita, and pop your own hand in for a photo opportunity. You’ll find it outside the entrance to the Santa Maria in Cosmedin church, which is also worth visiting. In can get busy here in the summer months, but the line is kept moving fairly quickly, so you won’t have to wait too long. 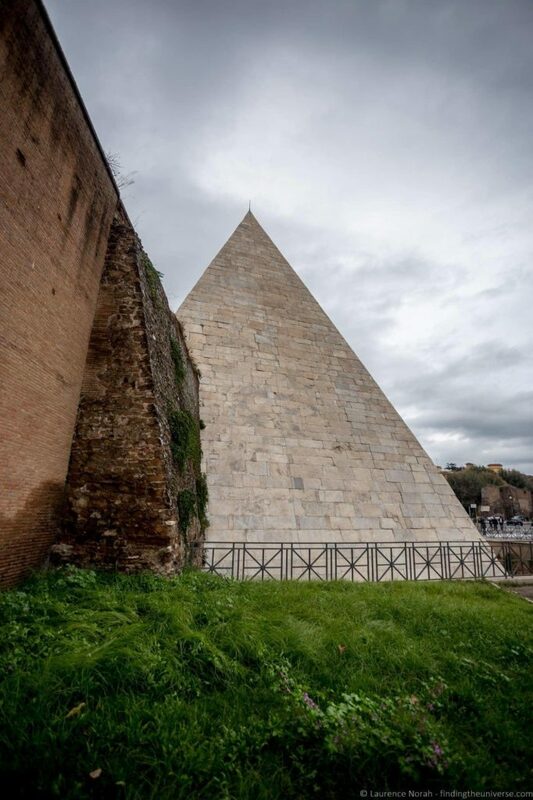 Did you know that Rome has a two thousand year old Egyptian style Pyramid? Well, it does. The Pyramid of Cestius was built around 12BC, at a time when Rome was obsessed with all things Egypt, to serve as the tomb for a wealthy Roman. The tomb has since been looted, and little is known about its original occupant, but the marble covered 36 meter high pyramid is the only one of its kind in Europe, and we think is definitely worth your time to visit. It’s now incorporated into the Aurelian Walls of the city (which helped to ensure it’s preservation), and one of the best places to see if from is the non-catholic cemetery of Rome. Whilst you’re at the cemetery, which is a beautifully peaceful spot, do take the time to visit the grave of the English poet Keats, one whose “name is writ in water”, who died in Rome at the young age of 25, far before his recognition as one of the greatest English poets of all time. Those Romans really liked to build stuff on a big scale. 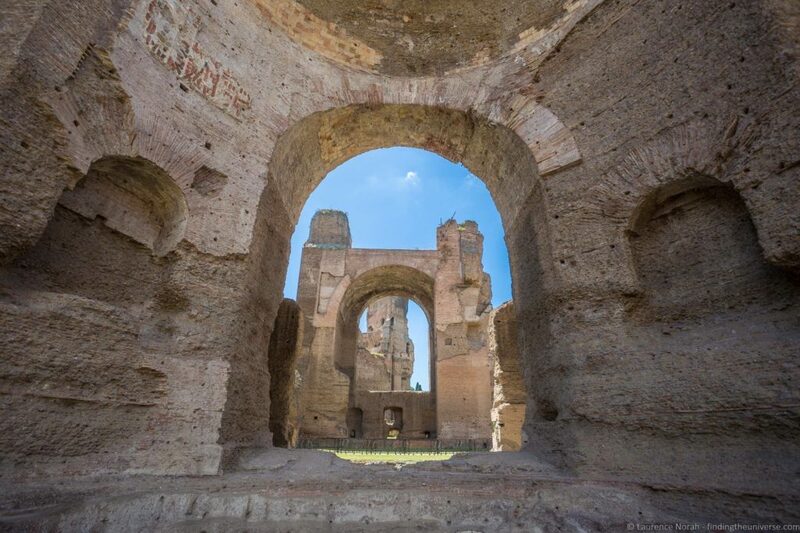 The Baths of Caracalla are no different. This vast bathing complex could accommodate up to 1600 bathers at one time, in a complex that covered over 62 acres. Whilst time has taken it’s toll on the Baths, they are still open to visitors. You can wander between the mighty walls and appreciate the vast scale of the operation and the millions of bricks that were used to construct them, as well as some of the surviving details like the mosaic floors. It’s not at the top of visitors lists to Rome, but is definitely one of our favourite spots to visit in the city, so we urge you to include it in your itinerary, especially as you’re already in the area. 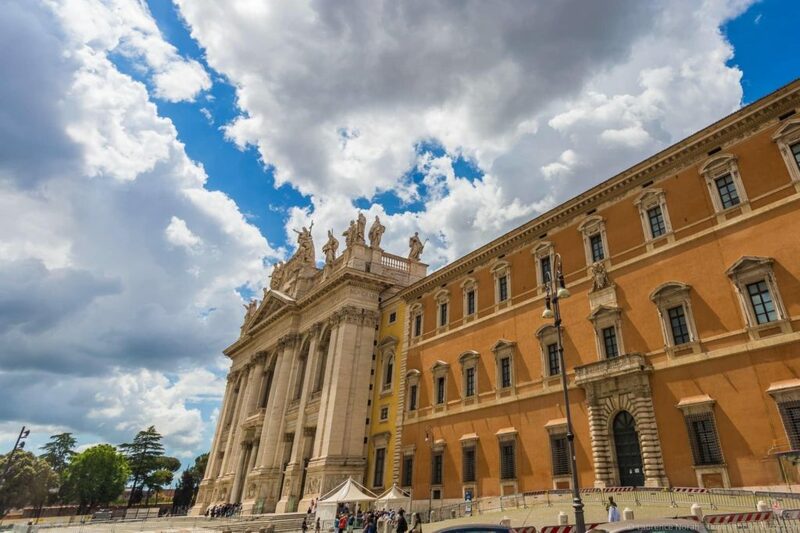 The Papal Archbasilica of St. John in the Lateran is the cathedral church of Rome and the seat of the Pope in the city, and as such, is one of the most important churches in the city. Whilst nearly everyone makes it to St. Peter’s Basilica, less people make it out here, to what is in fact the oldest Basilica in the city, making this a quieter and more relaxing place to visit. Highlights include the Lateran Obelisk, the largest standing Egyptian obelisk in the world, the Borromini designed Knave, the Cloister and the Scala Sancta. These lasts are a stairway of 28 steps, found in a building just across the road from the Basilica itself, which are said to be the same steps that Jesus walked up on his way to trial in Jersualem. Today, pilgrims to Rome can be seen climbing the stairs on their knees, which is the only way you’re allowed to ascend. Finally, find yourself some delicious food or perhaps a gelato, and congratulate yourself on another excellent day in Rome! For the third day on our three day Rome itinerary, we suggest you take a break from the city centre sight-seeing and head out along the Appian Way. Built in 312BC, this is believed to be one of the oldest surviving roads in the world, and was of enormous importance to the Roman Empire, linking the capital to southern settlements including Naples and Brindisi, and allowing for the quick movement of troops and goods. At the time, it was the widest and longest road in the world, and in testament to the quality of it’s construction, much of what you can see today is still original stonework. Those Romans built things to last! There are a variety of attractions to see along the Appian Way, beyond the road itself, and the key sights are to be found along the first ten miles of the road, in the Parco dell’Appia Antica. To get to these, you’ll want to head to the start point of the road, the Porta San Sebastiano, which you can reach via public transport from the city. From here, it’s a ten minute walk to the first major sight on the Appian Way, the Church of Domine Quo Vadis, which dates from the 9th century. Alternatively, we have heard from some readers that the walk along the first part is a bit tricky, so you can take the bus a little bit further than the start point if you prefer. After the Church, there are two Catacombs you can visit, the Catacombs of St. Callixtus and the Catacombs of St. Sebastian. The former are slightly larger and were the burial place of 16 popes, numerous Christians and a number of martyrs. The Borghese Gallery is in the Villa Borghese gardens, and houses the Borghese collection, a collection of art that is easily one of the finest in Rome. With incredible pieces from the likes of Raphael, Bernini and Caravaggio, to name but a few, this museum is truly a must visit. It’s not huge, spread across two floors and twenty rooms, but the high quality of work on display means that everything you see is basically a masterpiece. It’s also guaranteed not to be too crowded, as they only allow 360 people in at a time. Compare this to the 30,000 visitors a day that the Vatican Museum hosts, and you will enjoy being able to breathe whilst you appreciate the art on display. It’ll take forty five minutes to an hour to get to the Borghese Gallery from the Circus Maxentius part of the Appian Way, so you need to factor this in when planning your routes. Also, be aware that if you visit on a Sunday that public transport can be reduced. The reason I mention this is because the Borghese Gallery has timed entry and reservation is mandatory – even with a pass. To reserve, just call the reservation line: +39-06-32-810. Once you enter, you have two hours to see the Gallery. Alternatively, if you wanted to do a guided tour, your tour company will arrange the time for you, although again, these need to be booked in advance. 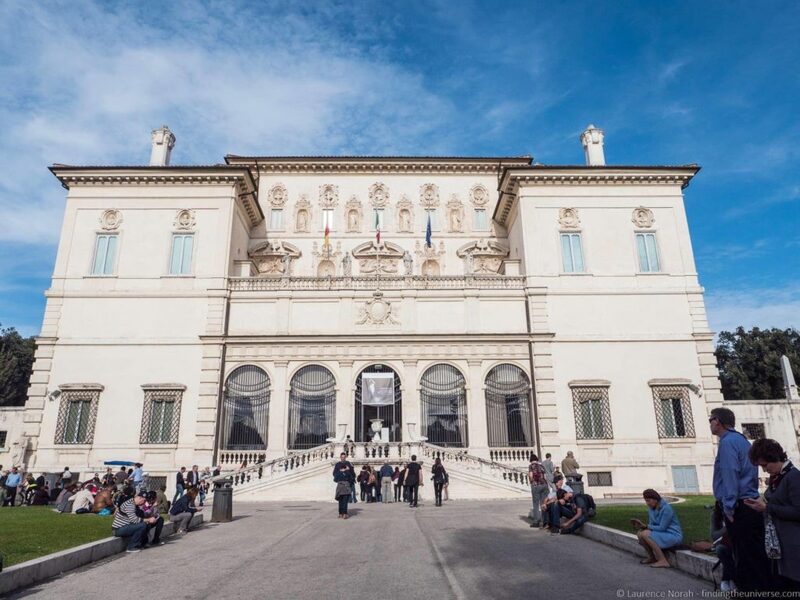 Read about our experience touring the Borghese Gallery with Walks of Italy here. Once you’re done with the Borghese Gallery, we recommend heading over the west side of the Gardens, towards the Piazza del Popolo. The view from the terrace overlooking the Piazza del Popolo is one of our favourite views in Rome. 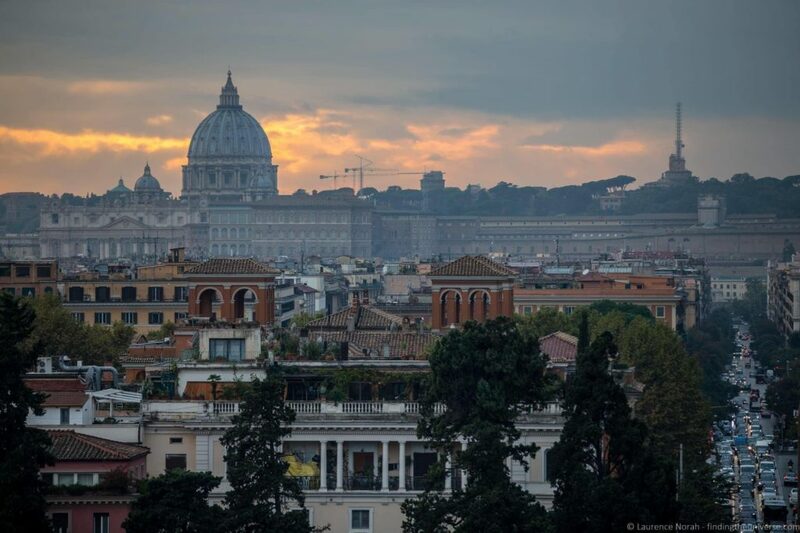 It’s particularly good at sunset – so do your best to time your visit here to enjoy that and reflect on three wonderful days spent exploring Rome! Here’s a map of the above itinerary showing all the attractions across the three days you’ll be in Rome. You can click here to see this map on Google. As with many cities around the world, Rome has a number of passes that help you get free and discounted admission, as well as skip the line privileges at key attractions – including many of the above. 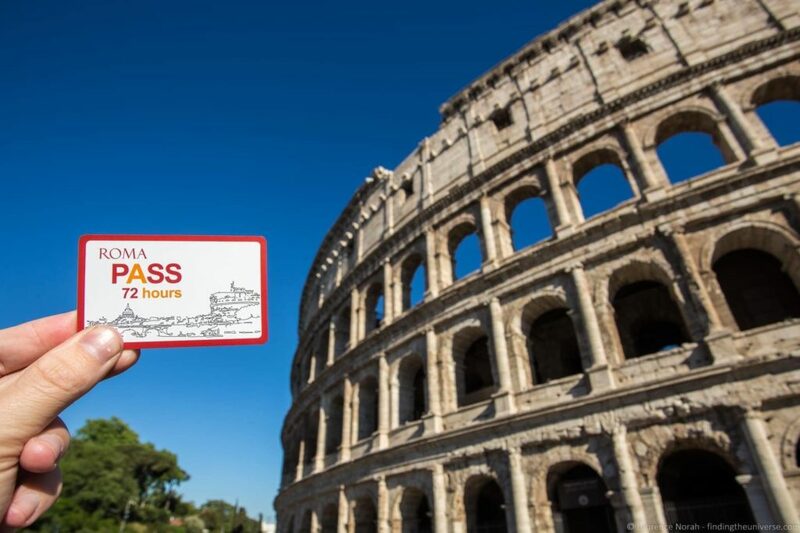 There are two main attraction passes for Rome that we usually recommend – the Omnia Rome and Vatican Card and the Roma Pass. Which you choose depends on your sight-seeing goals, so we’re going to go through these in a bit of detail now to help you choose. In brief, the card we recommend for our three day Rome itinerary is the Omnia Rome and Vatican Card. We think this offers the best combination of value for money, attraction entry and skip the line access. This pass is brought to you by the same folks who also run some of our other favourite city passes including the London Pass and the Barcelona Pass, and consists of two physical passes – an OMNIA card and the aforementioned Roma Pass. Free entry to two out of six listed attractions, which includes the Coliseum, the Roman Forum, Castel Sant’Angelo and the Borghese Gallery. As you can see, this pass includes a lot. One of the most valuable aspects of it, in my mind, is the skip the line access at the Vatican Museum, St. Peter’s Basilica and the Coliseum. I cannot stress enough how important these features are. The line for the Vatican museum in particular can be hours long (seriously, hours), and in the heat of the summer this can be a torturous experience. 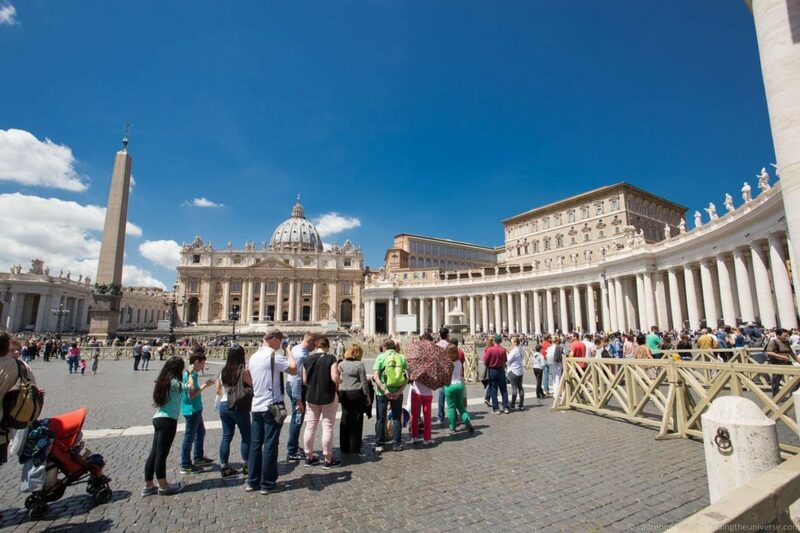 The Omnia Vatican and Rome Card gets you past this queue and straight in to the security line, and the same applies at St. Peters Basilica and the Coliseum. Seriously, don’t waste your time in Rome standing in line. To get the most out of the Omnia Vatican and Rome Card though, you have to be a little bit clever, and plan ahead. Or, you can just follow my itinerary, as I’ve ordered the attractions in a way that will save you the most money when using the Omnia Vatican and Rome Card. As you can see, there’s a list of six attractions, of which you can choose two that you get free entry to with the card. As these are not all the same price, to maximise your savings you want to try and use your free entry on the most expensive attractions. Once you’ve used those two entries up, you will get a discounted admission when you use your card. Based on the three day itinerary above, we recommend you use the pass for free entry to the National Museum of Castel Sant’Angelo, and then for the combined entry ticket to the Coliseum and Roman Forum. This will save you €34.50. The other thing to be aware of is that for some attractions you need to book your entry in advance. These include the Vatican Museum, Coliseum and St. Peter’s Basilica. My advice, as you can see in the itinerary, is to book the earliest entry you can. The Vatican Museum gets very busy, and the first hour or so in the morning is the quietest time to visit. Note that whilst you have to pre-book your time for St. Peters Basilica, there isn’t actually a timed entry, so you can enter at any time of day on the day you specify. Also be aware that skip the line access isn’t available on Wednesdays due to the Papal Audience. For the Coliseum, see the section below on how to reserve your timed entry slot. You might be wondering how much you will save with the Pass. Well, if you follow the itinerary above, purchasing skip the line tickets for attraction where available, you’d be looking at around €100 in entry fees. Then there’s the travel card which is currently worth €18, and the Hop-on Hop-off bus which is valued at €32. So a total value for this itinerary of €150. 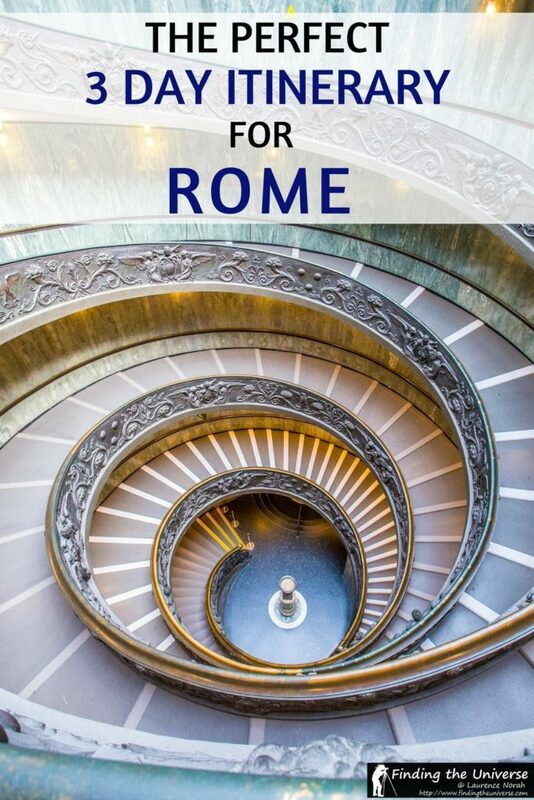 Currently, a 72 hour Omnia Vatican and Rome Card is €113, which we think is excellent value. They also regularly run sales, making it even more of a bargain. You can of course book tickets individually for some of these attractions which include skip the line access. This will be more economical if you only plan on visiting some of these attractions, although does require a bit more advance planning and you’ll have to make a number of individual purchases. For example, you can book Vatican tickets directly here, Coliseum tickets directly here, and St. Peters entry tickets directly here. If you go down this route, make sure you choose the option that lets you print the ticket yourself so you can proceed directly to the security line. Note that the Coliseum now operates a timed entry system as well, which as of 1st March 2019, includes pass holders. Also be aware that there are many sites that sell tickets at a mark-up, so do only buy from the official site for each attraction. The exception to this is St. Peters Basilica, which doesn’t sell its own fast track tickets, so we have linked to the best site we know of for fast track entry tickets. The other pass that is often recommended is the Roma Pass. Whilst this comes with the Omnia Vatican and Rome card, it can also be purchased separately, in a 2 day (48 hour) or 3 day (72 hour) version. 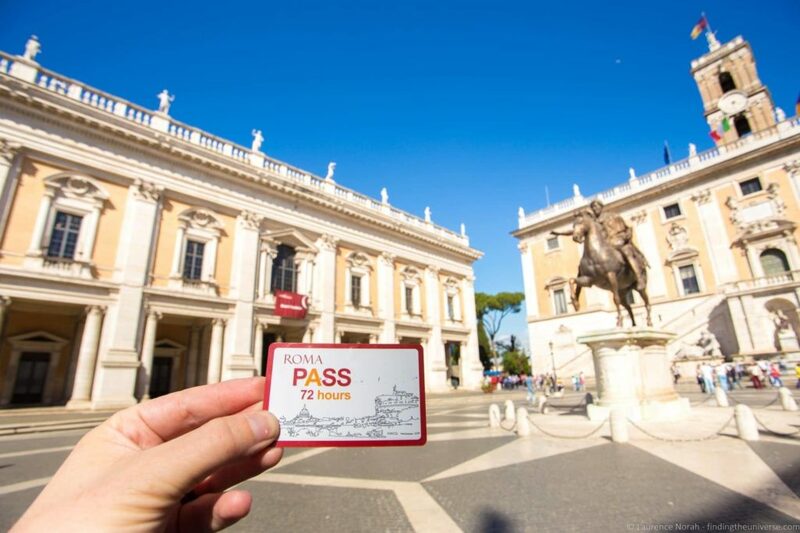 The Roma Pass includes free / discounted admission to many of Rome’s attractions as well as a transport card for the public transport network in Rome. 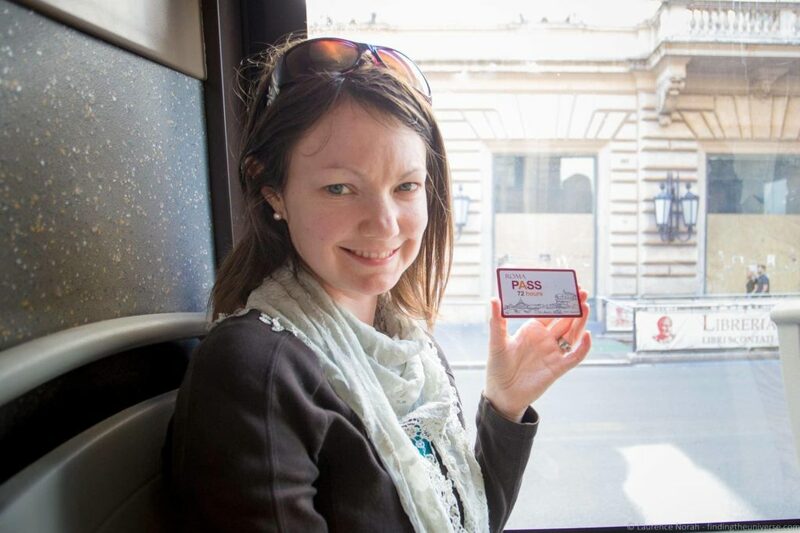 However, it doesn’t include entry or skip the line access to any of the Vatican attractions, including the Vatican Museum or St. Peters Basilica, nor does it include the Rome Hop on Hop off bus. We think that for 3 days in Rome, the Omnia Vatican and Rome Card is a better option, particularly if you’re following our Rome itinerary. For us, the true value of the Omnia Vatican and Rome Card isn’t the cost saving – even though it does offer that. Instead, it’s the fact that it makes it so much easier and hassle free to visit Rome. You’ll get to all the attractions you’re really going to want to see without spending time standing in line. And that’s why we think it’s worth investing in. You can buy yours from the official site, here. As of 2019, all visitors to the Coliseum have to reserve a timeslot for visiting the Coliseum. This is to help manage the number of visitors coming to the attraction, which is very popular. If you buy your ticket directly from the official website, you will specify a time and date when you buy the ticket. Roma Pass and Rome and Vatican Pass holders have entry to the Coliseum included, but you still have to make a reservation, which you can do either by calling the reservation line, or (more easily) by booking online. 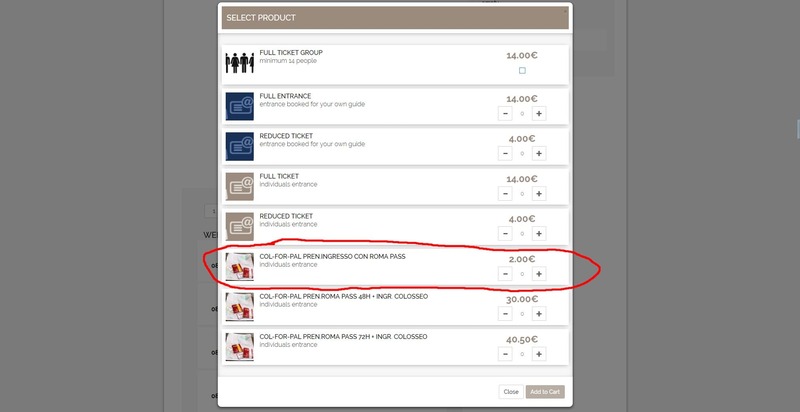 Both options cost €2 if you hold a Rome and Vatican Pass or Roma Pass. To book your reservation online, go to this web page. Then, pick a date and time slot at the bottom of the screen. It is easier if you do this with “solo disponsibli” checked, as it will show you only available times. Here is a screenshot of the page to show you what I mean. Once you pick a time, you should be able to choose a ticket type, and one of them will be “COL-FOR-PAL PREN.INGRESSO CON ROMA PASS individuals entrance” at a price of €2. That is the one you want to buy. Again, here is a screenshot with the correct option circled. We recommend booking your timeslot as far in advance as possible so you can get the time you want. Rome is really easy to get around, with much of it very walkable. The itinerary we’re laid out is designed to be logical and easy to follow, so you won’t waste time getting from place to place. Getting from each location to the next should be either a short walk, or a single bus or metro ride away. 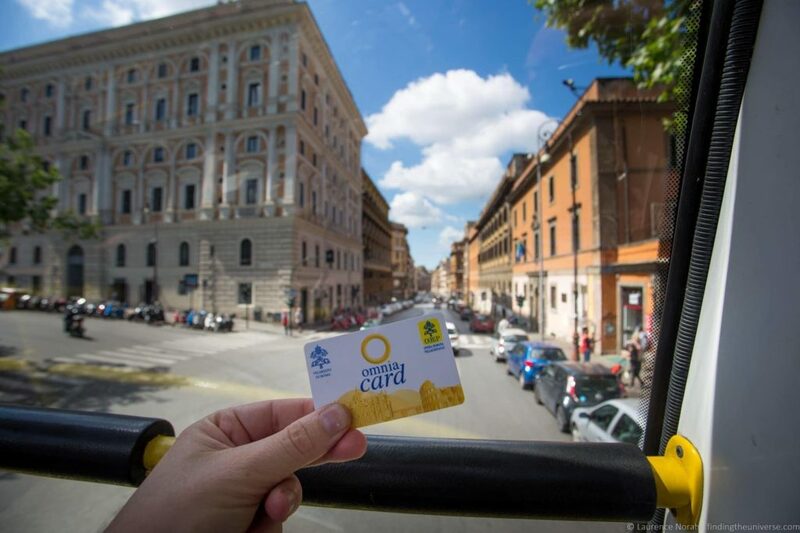 If you decide to buy the Omnia Vatican and Rome Card it includes free public transport for your three days in Rome, as well as the Hop on Hop Off bus. Alternatively, you can either buy a travelcard yourself, or just buy tickets as you go. A one way ticket, known as a “B.I.T” costs €1.50 and is valid for 100 minutes from when you activate it. With the B.I.T. you can change transport types as you go, with the exception being you cannot re-enter the metro system if you leave it. These single tickets can be bought from metro stations as well as convenience stores and newsagents, and need to be activated with a timestamp when you board the first transport. For buses this will require putting the card into a machine located on the bus. Metro entry barriers will automatically timestamp your ticket as you insert them at the barrier. Not stamping your ticket is the same as travelling without a ticket, and you can be penalised for doing this. Rome certainly has no shortage of places to stay. For this three day itinerary, we’d suggest you stay somewhere central, to make accessing all the attractions as easy as possible. Our suggestion would be to stay somewhere in the area between the Piazza Navona, Piazza Venezia and Piazza del Popolo. Of course, there are many more options. We tend to use Booking.com for most of our accommodation when we travel, they have a wide selection of options, with everything from hostels to apartments to hotels. The review system makes it easy to pick a good option, and they have an excellent cancellation policy. As an example of what is available, beyond the above mentioned hotels, here’s a well rated hostel, and a fantastically located apartment. As you can see – loads of options! Of course, Booking.com isn’t the only option. We’ve also stayed in apartments and vacation rental properties in Rome, often booked through AirBnB. If you’re interested in using AirBnB, this link will give you a discount off your first stay. If you can’t find what you want on AirBnB, we’ve got a definitive list of AirBnB alternatives to help you get a decent vacation rental. With a Mediterranean climate, Rome is a city that can be visited throughout the year. However, it gets very busy and very hot in the summer months, especially in August, so we’d advise avoiding August if you can. If you must visit in August, we highly recommend you pick up the Omnia Vatican and Rome Card so you don’t have to queue for attractions in the unshaded heat. We’ve visited Rome at all times of year, and our favourite time to visit is April / May, which we think offers a good balance between nice weather and less crowded attractions. Another thing to be aware of is that many museums and attractions are closed on Mondays. In addition, there is free entry to lots of the key attractions in Rome on the first Sunday of every month – we’d suggest avoiding this day if you possibly can as the crowds are unbelievable! Safety: In our many visits to Rome we’ve never had any safety problems although pickpocketing is not uncommon in crowded tourist areas. As always, practice basic safety precautions. Keep valuables concealed, don’t carry large quantities of cash, only use official taxis and so on. Power: Electricity is of the 220v standard, with the 2 pin European style plug. Travellers from countries like the UK and the US will need a travel adapter like this, and US travellers need to check their equipment supports the 220v standard – it will be written clearly on the power adapter. Currency: Rome is a part of the Eurozone, meaning the currency is the Euro. You can get these from ATM’s, banks and currency exchanges, although credit cards are of course widely accepted. We suggest using a credit card where you can – just ensure it has no foreign currency transaction fee. Internet: Internet access is widely available in the form of WiFi all around the city and in hotels and coffee shops, so you shouldn’t have any trouble getting online. You can also pick up local SIM cards if you have an unlocked phone. Travellers from the UK on the Three network will be able to use their Feel At Home data, which is a great deal if you’re a regular traveller from the UK. For more options on getting online when travelling, check out our guide to getting online when travelling to help you figure out the best options. Water: The water in the taps is safe to drink, although many locals prefer the taste of bottled water. You can also drink the water that comes out of the taps in the fountains, so just carry a drinking water bottle with you and hydrate as you go. Of course, if you don’t like the taste, bottled water is widely available. Clothing. Many of the attractions in Rome are holy places, and you need to be dressed appropriately. There are big signs up explaining what you should wear, but generally, you need to have clothing that covers your knees and shoulders. This can be an issue with warm weather clothing choices, particularly in summer, so we advise that if you choose to wear tank tops or shorts to keep items to cover your shoulders and knees with you like shawls, scarfs, long skirts, or pants that convert into shorts. It may be that on your day of arrival or departure in Rome, you’ll find yourself needing to leave your luggage somewhere. Usually your hotel or apartment will have left luggage facilities, however, if this isn’t the case (often the case with apartment rentals for example), you will definitely want somewhere to leave your luggage for the day while you sightsee. Many of the attractions in Rome won’t let you take bags in with you, and even those that do will require you to do additional screening. We’ve taken a number of tours in Rome, and can definitely recommend these if you’re looking for a guided experience. For walking tours specifically, the two companies we recommend are Context Travel (10% off tours with this link) and Walks of Italy. 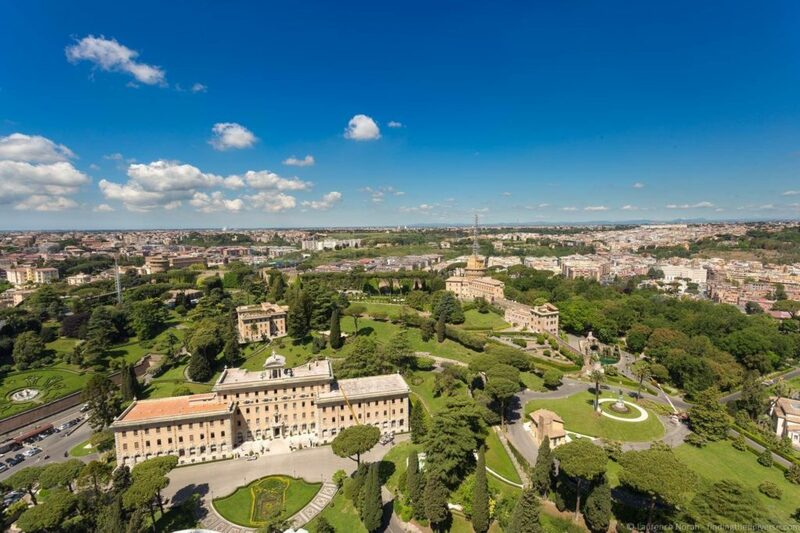 With Walks of Italy, we can recommend the “Pristine Sistine” tour, which gets you early access to the Vatican Museums before they open to the public, which is even better than skip the line access. If you decide to do this, then you may find that a Roma Pass is going to be better value than the Omnia Rome and Vatican Card. Another excellent Rome tour they offer is their Rome in a Day tour, which covers many of the highlights of the city in one day, which is a great way to see the sights in Rome and not worry too much about skip the line tickets and queues. We also took the “VIP Caesar’s Palace tour with the Colosseum & Roman Forum” tour, which covered the Roman Forum and the Colosseum, as well as the 1st century BC home of Emperor Augustus, previously off limits to the public. Finally, we took a tour of the Borghese Gallery on the “Borghese Gallery Tour with Tickets”. We also did tours with Context Travel, who offer very small group tours for the intellectually curious. These were fairly specialised tours, one focusing on Rome, the Grand Tour and the Romantic Poets, and the other on the history of the Popes and Rome political power. We’ve written fairly extensively about our tours with these two companies in Rome, and I link to these reviews in the further reading section below to help you decide if these are going to be good options for you. There are of course other options for tours in Rome, including all the tours on this page, which offers a variety of things to do from different providers. So definitely check out the options to figure out what is best for you! Having read all the above, I hope everything is clear. I admit, Rome is a wonderful city to visit, but planning in all the attractions and avoiding those dreaded queues might feel a little overwhelming. With that in mind, here’s a quick checklist to help make sure you get the most out of your stay. Decide if something like the Omnia Vatican and Rome Card is going to be for you, and purchase it in advance. 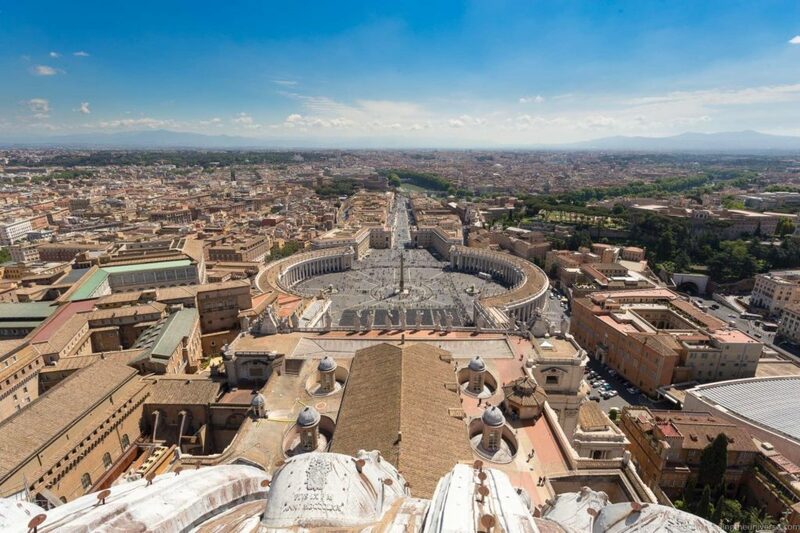 If you aren’t interested in the Vatican attractions, or are going to visit them on a walking tour, you should definitely consider the Roma Pass instead. This includes transport and a number of other attractions in Rome. If you’re not getting an Omnia Vatican and Rome Card, make your reservations in advance for all the attractions you know you want to visit which aren’t part of any walking tours you book. In particular, our suggestion would be to book in advance for the Vatican Museum, the Coliseum and the Borghese Gallery. Enjoy your trip to Rome knowing you’re not going to waste time in line for anything but gelato! I’m often asked in the comments on this post, and our other Rome content, where to go after Rome, and the best way to get there. My advice if you want to explore Italy a little bit further is to visit cities like Florence and Venice. The easiest way to get to these is to take the fast train service. These run frequently and are very quick. Tickets are cheapest when booked well in advance, plus booking in advance will usually guarantee a seat reservation. You can book train travel in Italy (and Europe in general), on our recommend train ticketing site: Trainline.com. This day tour to Florence. This is another version of that tour by train instead of minivan. As you can see, you have plenty of options from Rome! Well, that was a lot of content to help you plan your trip to Rome! As well as the above, we have a number of other resources we’d like to recommend to help you out, both content we’ve written ourselves, and resources we’ve found online. Between this post and these resources, you should be able to put together the perfect trip to Rome! If you’re in Rome for a shorter amount of time, check out our guide to spending 2 days in Rome, or a day in Rome, which will give you some other options for your visit. We’ve taken a number of tours in Rome. You can read about our experience visiting the Vatican, Coliseum and Roman Forum with Walks of Italy in Rome here, and our experience at the Borghese Gallery here. With Context Travel, you can read about the Grand Tour and the Romantic Poets tour here, and Popes, Power and Parties here. And that sums up our idea of how to spend the perfect three days exploring Rome! We hope you found this itinerary useful. Are you planning a trip to Rome? What do you want to see when you do? Let us know in the comments below! I am happy that I came across your site. I’m struggling to put our itinerary together and yours seems to be a good fit. (and I’ve researched a lot!) My husband and I will be in Rome Sunday,May 12, 2019 with our flight landing at 8:15 am and leaving Wednesday,May 15th in the morning. 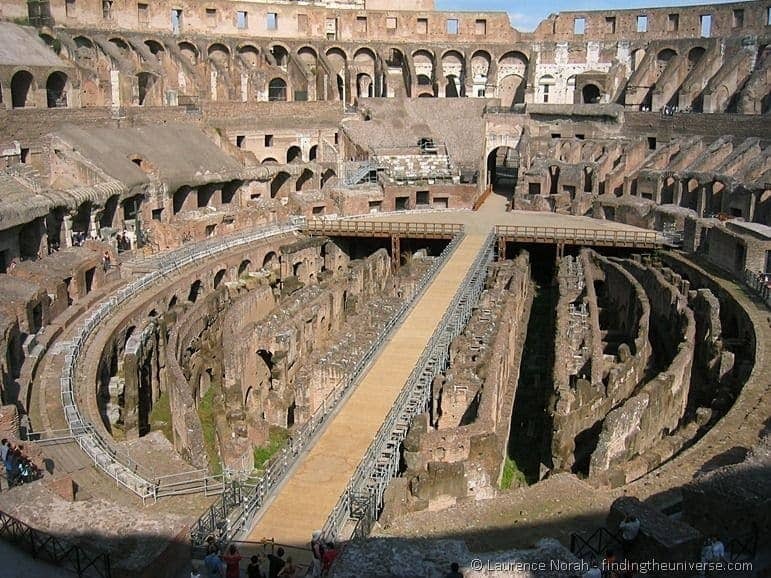 We want to do the Colosseum on Sunday with the underground tour (the latest is 2:00 pm) but also purchase the Roma Pass. What I’ve read online is that I have to call the Colosseum to add the underground tour to use the Roma Pass. I don’t think we can squeeze your Day 2 itinerary into our Day 1 (with flight time and Hotel check-in) and the Vatican is closed on Sundays. Any suggestions as to how to mix it up? Thank You! I have to admit I’m not sure about adding the underground tour to the Roma Pass, but if that’s what you’ve read then I’m sure that is likely correct. 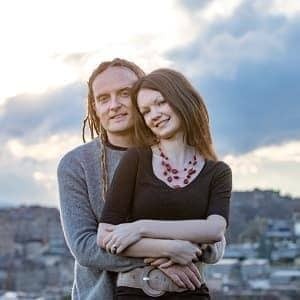 Have a great trip, and let me know if I can help any more! Thanks for this amazing itinerary, I can’t wait to visit in less than a week! Just a quick question what do the ladies normally wear out there? Im more of a short person however, a lot of websites so not to wear them. I know knees/shoulders have to be covered in holy places, but would it be acceptable to wear shorts when visiting the colloseum and will i be the woman wearing them if i do? Our pleasure! So for the religious buildings like St. Peter’s, as you say you do need to cover from just below your knees up to your shoulders. So this is why most people don’t wear shorts, as you have to change to something longer. But it’s perfectly acceptable to wear shorts to other places like the Coliseum or the rest of the city, and I’m fairly sure you won’t be alone if you do so! This was a great read and I’m sure I will check out all of these places when we go to Rome in March. My sisters and I went to Paris this spring and we bought a pass as that was the least expensive way to do it. My question though, is we will be in Rome for 19 days and I don’t want to cram all of the sight seeing into just a few days. Would it still be cost effective to purchase a pass? Also, because we will be staying outside of the central city because we do have some meetings to attend, we will be renting a car. I think we will use it mostly use it outside of the city and then when we go sight seeing, we will park somewhere and use public transit. Would it still be worth us buying a pass for public transit? Thanks again for the wonderful tips. Thanks. I think for 19 days a pass isn’t going to deliver much cost benefit, as most of the passes we are aware of are time limited, and if you don’t see a certain number of attractions, then the pass cost won’t be worth it. So if you want to spread your attraction viewing out, then it’s unlikely to be cost effective to buy a pass. Instead, you should just be sure to book your individual tickets in advance to skip the ticket lines. I’d also say that a transport pass will be unlikely to save you money. 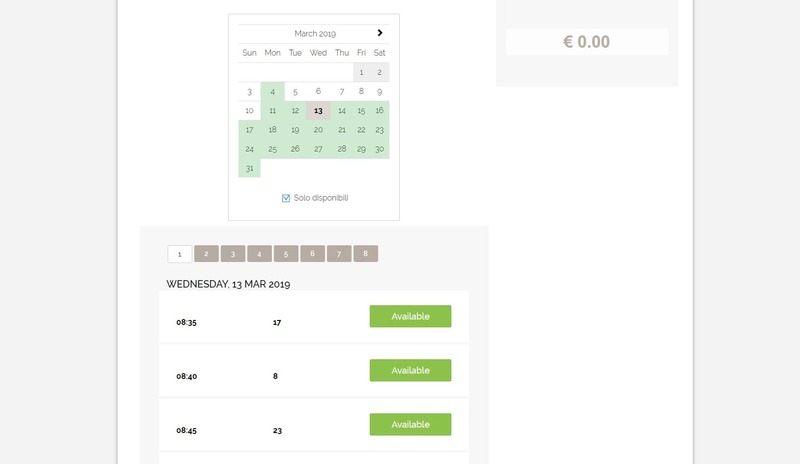 Individual tickets, good for 100 minutes of transport, are only €1.50, so unless you plan on taking a lot of transport, it will probably be cheaper to just pay as you go. This ‘3 day’ plan is AMAZING! My husband and I are going to Rome in February half term (Im a teacher so can only go then) so this has given us loads of great ideas. Id like to ask a few questions though, if I may. 1. Should I get the ’skip in lines’ even for first thing in the morning in late Feb? 3. Does the entry to the Vatican museums (€17+€4 for skip the queues) include Sistine Chapel and St Peter’s Basilica?? It says Basilica is free to enter but some sites charging €14,50 as fast track into the Basilica….is this worth it? Does the ‘fast track’ into the Vatican museums also get you fast track into the Basilica/Sistine chapel? 4. Is the Sistine Chapel extra if you have paid the entrance fee to the Vatican museums? 5. Castel Saint Angelo – worth a visit? Some people say just lots of fancy rooms…maybe just a visit from the front? 1 – it’s less likely you’ll need skip the line tickets at this time of year, especially if you go early in the morning. February should be a fairly quiet month. That said, you might want to add up the individual prices for each attraction you want to visit and figure out if something like the Omnia Vatican and Rome card will either save you money, or even if it’s a little more expensive, it might save you a bit of time. 2 – It’s up to you of course! We’ve visited the Vatican both on our own and on a guided tour. We definitely learnt a lot more with the tour than we did on our own, obviously, plus they know the fastest ways to the main highlights. 5 – It’s very hard to answer this as what one person finds interesting another person doesn’t 🙂 We enjoyed visiting, and it’s certainly an ancient building with a great view from the top, but it’s also pretty from the outside. So if you wanted to save money you could skip this. I hope this helps – happy to answer any follow up questions too! Thanks so much for this; you certainly know your stuff! Completely forgot to check this site for the answers so sorry its taken some time for me to reply. Just wondering about a switch round then of the Vatican and St Peters. Was going to do it that way round but if St Peters is open at 7am then may do that first and then the Vatican. If we did it that way, would we need a skip the queue for the Vatican for 9am when it opens do you think? Also, can you recommend a roman bath experience. In late Feb I think some heat and relaxation would be quite nice. That would certainly make sense to switch them round. I don’t do it like that in the itinerary as most people aren’t going to get excited about a 7am entry time, but if you are fine with that, you can go for it! I would say that in February the queues for the Vatican aren’t likely to be that long, especially at 9am. Although just bear in mind that many of the tour groups do go 8.30am – 9am, so you might have to wait a bit. It shouldn’t be round the walls queues though, as it is in summer as the day progresses! I have never taken a Roman bath experience in Rome, so unfortunately I don’t have any recommendations there. Have a great trip, and let me know if you have any more questions! Hi we would like ti spend 4 days un room whatbis the weather like on med October? October is a good time to visit Rome, it’s not as busy as the summer, and the weather is usually mild, usually between 12C and 22C. However, the chance of rain is increased, so you’ll want to be prepared. It can also be a bit cooler, especially at night and in the morning, so bringing some warm layers is advised. Thank you so much for the itinerary, We managed to follow most of the things listed but because of the thunderstorms we experienced over the three days we were not able to do all of it and sadly missed a whole days worth of sightseeing. As a result we picked the most of the important aspect from your plans which were a big help. We decided not to use the discount cards due to the weather which worked out cheaper but if the weather was better then I feel that it would have been more worthwhile for us. We decided to spend a little more on the Colosseum and do a moonlight tour to avoid the crowds and this was the hightlight for our holiday. What a good blog about Rome travel. I will be following your trip for my Mid September visit to Rome. I am reaching Rome from New York around 12:30 PM on 18th September and leaving early morning 21st Sept, do you thing I can do the 3 days itinerary in 2.5 days? Also do you suggest to buy Omnia and Vatican card or Roma card? I actually had a similar question by e-mail recently. I think this is possible, but you may have to juggle the itinerary a little bit. My suggestion would be to do the Vatican on the day you arrive. You might also be able to fit in St. Peters Basilica, but it’s unlikely, and you also probably won’t be able to into Castel Sant’Angelo on this day either. However, if you don’t mind getting up early, St Peter’s opens very early in the morning, so you could do that and Castel Sant’Angelo on the morning of either the second or third days. 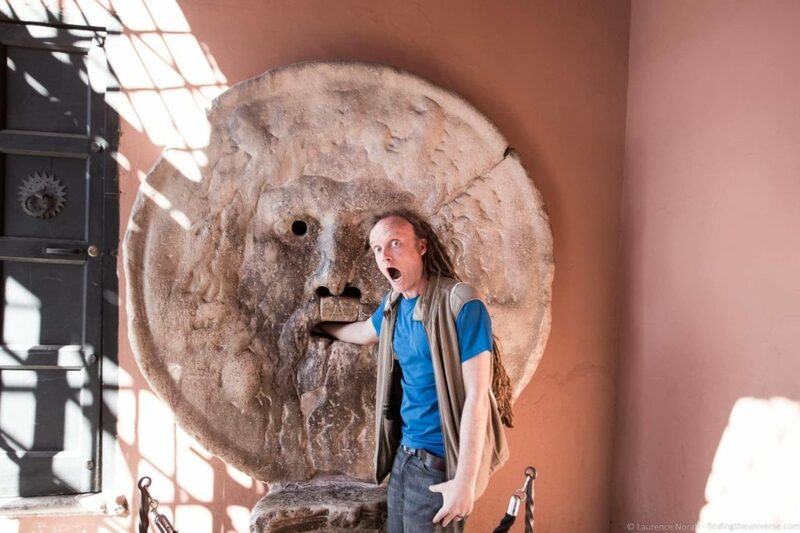 You may also have to adjust when you visit the Pantheon as that has opening times. Everything else on the first day will be do-able as it’s attractions that are outdoors. For the trip, we would recommend the Omnia and Vatican card if you plan on seeing everything on the itinerary, as it will let you pre-book your Vatican entry and get skip the line access to the Vatican and St. Peters. I hope this helps – have a great trip, and do let us know how it goes! Thnaks for the detailed explanation Laurence. I would like to do Vetican part of Rome without rush so planning to go there on Thursday. I was thinking to do Day 3 of your itinerary on the day I arrive in Rome as it have less places and not the ones which are must see in my list. Is that sounds good? Absolutely Trinetra, that makes sense. You should just check the opening hours of any of the attractions you definitely want to visit along the Appian Way so as not to miss them 🙂 Then you will have two full days to do everything you want to do. I bought card and proceeded to book Vatican Museum @10:00 AM and the found only available slot for St. Peter’s Basilica and the Tomb of the Popes was for 13:00 PM I have booked that as well but then I started thinking is 3 hours is enough for getting into Vatican and then to St. Peter’s? Are they very strict about timings? is there any way I can modify my reservation if the time is not enough? I hope this helps – it should mean that as long as your ticket is for that day, you should be fine! Thank you so much for a very well planned and written itinerary! We are staying in Rome for 4 nights in September, so your 3 day itinerary is perfect. We will be arriving in Rome at around 11am on Thursday 27/9, after a 4 hour bus trip from Sorrento. We plan to follow your 3 day itinerary exactly from day 2 of our stay. This being the case, what would you recommend we do for the first half day on the day of our arrival? Thanks Laurence, Wandering around the Trastevere district will be perfect! One other question – does the hop-on bus go to most of the locations listed in the 1st two days of this itinerary? Can you reach these sites through their local transportation , Taxis or rental car? Thank you for this wonderful guide! We’re planing to spend 3 days in Rome at the beginning of Nov. One of the days would be a Monday though, so how is this going to affect our itinerary? Also we have a 3 years old boy so I’m not sure how much walking we can do. Are these locations accessible with a stroller? Also do you have an idea on how is the weather in Nov? Your advice would be much appreciated. Hope this helps a bit – have a great trip! My wife & I have just been on your 3 day tour of Rome and it was Fabulous. We are on our 25th Wedding Anniversary and couldn’t have wished for a better trip and this was all down to you. You gave us a purpose & we visited sites that was beyond our dreams. Hi Graham! First, congratulations on your anniversary. What a wonderful way to spend it 🙂 We are so pleased that you stopped by to let us know our guide worked for you, it’s the sort of feedback that really makes us smile! We’re thrilled you had a good time and that we were able to help. For Berlin & Krakow – we have been to Berlin but haven’t as yet put together a detailed guide to visiting. Krakow is on the shortlist for next year – I know that doesn’t help right now, but stay tuned! We our truly thankful for your brilliant advice, we have had such a Fab time. The feedback is throughly well deserved & hats off to you two. Knackered but exceptional journey & your correct Gardens was great at the end, sorry to say we shared the rowing boat time between us. I bought the OMINA Card online and then went to book the Vatican and St. Peter’s Basilica. Booked Vatican museum successfully at 10am but for the basilica, Wednesdays are always unavailable even 5 months from now and other days timings are only 9am and 4pm. Do you have any information about that? Ideally I should book around 1pm to give Vatican museum and Sistine chapel 3 hours. this blog is very informative and great read. Me and my husband will be visiting Rome next year and it will be our first time there. May i know what is the nearest airport to the Day 1 Itinerary? what are the transportation to take from airport to the attraction? Cost? Are there a lot of English speaking people? Thanks very much. I’m sure you will love Rome (and Paris :D). Rome has two major airports, Ciampino and Fiumicino. The first is smaller, and primarily serves budget airlines, the latter is bigger and handles more of the international traffic. Fiumicino is easier to get to and from, it has a train station and it takes about 30 minutes to get into the city center. There are also regular buses and taxis. Ciampino has a nearby train station, and also regular buses. So also quite easy. Hope this helps – have a great trip! Is it doable to go from Florence everyday(for three days) by fast train to Rome for sight seeing? Or is it going to be very hectic? Leave Florence around 8:00 am to go to Rome and leave Rome around 7-8:00 pm to go back to Florence. BTW you have compiled very useful info on “Rome in three Days”, This is what exactly I was looking for. Well, it is possible, but I have to be honest, I’m not sure why you would not just stay in Rome – this would add expense and lost time into the equation. But, yes, it could be done. Have a great trip! I am chaperoning a class trip to Italy on June 29th. I was looking for a suggestion for a day in Rome. We have one free day in Rome . The other day in Rome we are doing a walking tour through the Vatican Museums to reach the Sistine Chapel at the end of a visit to St. Peter’s Badillica. Free time is given for lunch and to explore Vatican City. During our free time I am going to take them to Castel San’Angelo. Hey Denise! Sounds like you have many of the major highlights covered on that one day. I think your tour is also likely to take in the Pantheon, but if not, do make sure to add that in. So my suggestion would be to head out to the Baths of Caracalla, visit those and St. John in the Lateran Church, and then perhaps to explore the Appian Way. This is a different side of Rome to what you will have already seen, a bit more green, so should be a nice contrast. Hope this helps – have a great trip! This itinerary looks awesome and I think it covers the main spots. However, i am going to travel with my parents (in their 70s) and although they are healthy, I am not sure if its too much walking in a day. What do you think is your average daily steps taken? Thanks very much – and this is a good question, which I have to admit, is a bit hard to answer. 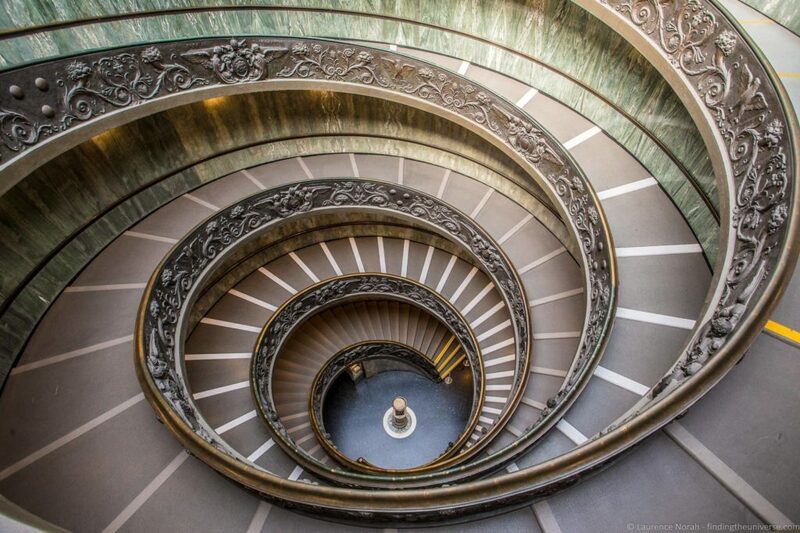 This is because it really depends on what you aim on seeing – the Vatican alone for example has 7 miles of corridors! I actually did a tour like this a while back with my grandmother, and she did pretty well. From the map I’ve provided you should be able get an idea of the walking distances involved. 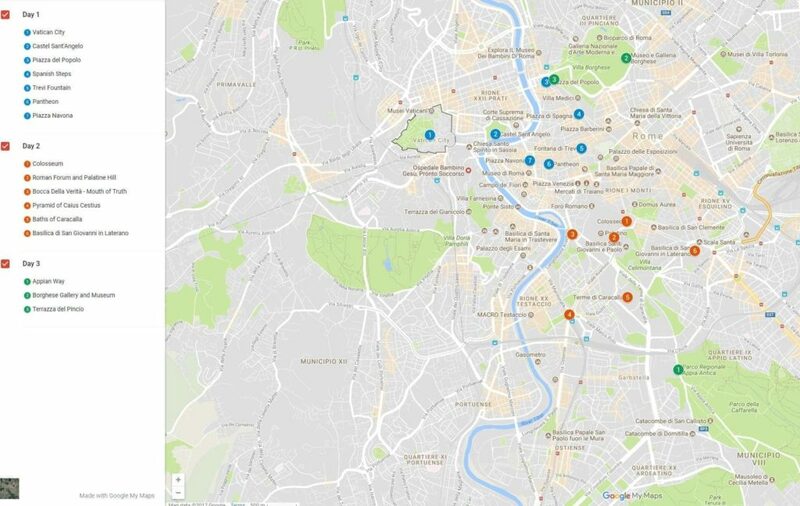 I would also add that Rome has a really good public transport network, so you can definitely cut back on walking by taking advantage of the bus / metro system between the main points (or using the hop on hop off bus). I would also say that when we walk these routes out, they often come in at around 20,000 steps for us, but again, that’s just an approximation. Certainly 10,000 – 15,000 would be a good number to think of, and you can probably cut back on that like I said with public transport. Have a great trip, and do let me know how it goes! hi ! this is a great blog and i really appreciate the time and energy put into this. could you please provide a link to the site where we can book the required tickets in advance? Hi Oorja – thanks very much! For the Rome and Vatican Pass, if you buy that then when you have bought it you will be sent a link to book your times in advance. I bought the pass but it does not give you the option of scheduling the coliseum or forum. Also, St. Peter’s Prison is included but not on your itinerary, where would you squeeze it in? For the Coliseum and Forum with the pass you don’t need to schedule the entry, you just go straight to the security line. You don’t need to queue for tickets if this is the first or second use of the pass, which it would be if you follow the itinerary. Hi. I was wondering if I need to make reservations for 2 out of the 6 free attractions before hand or do I just show up to the places and show my card and get in? Great Blog and amazing suggestions. You took away hours of research time I would have spent trying to finalize my itinerary. Appreciate it. My teenage son and I just got back from our trip to Rome. We were able to maximized our trip to Rome thanks to your blog and itinerary. Had it not been for them, we would be clueless what to see and much less how to batch up the places. We didn’t buy any of the passes. We did a LOT of walking. We got lost often but that lead us to see something else interesting that were not in the itinerary. Tickets to the important sites were bought online in advance from the websites of the places itself so they were a bit cheaper. Maybe because it was just after lent so the queues were not that long if any and it still being spring, the weather was wonderful. Again, thank you. You also gave me confidence in going to my very first adventure in a new country. That is wonderful to hear, I am delighted you had a good trip! Certainly, at quieter times of year you can be lucky with the queues and the weather, and it sounds like you were 😀 – plus making those reservations in advance will have helped a lot too 🙂 Thanks for stopping back to let me know how it went! In practice, I think it is a little different. The Omnia Pass actually comes as two passes – an Omnia card, and Rome card. The Omnia card covers the hop on hop off bus and the vatican attractions, and the Rome card covers the public transport and the other Rome attractions like the Coliseum. So, I *think*, the Hop on Hop off part of the card will only activate the Omnia Pass. So as long as you see the Vatican attractions on your first three days, you should be fine. Of course, I can’t guarantee this, but as I recall when I got on the hop on hop off bus, they only used the Omnia Pass rather than the Rome card, so it wouldn’t have activated. Great advice, I am trying to decide on the Rome passes or just buy the hop on-off pass as it includes Vatican museum and coliseum. What do you think? Also, Can I use the Rome pass to get from the airport to termini station? I would say that it’s really up to you and what you want to see in Rome – the Rome Pass is slightly more expensive (although on sale right now) but also includes a few more attractions (plus skip the line access to St. Peter’s Basilica), as well as a three day travelcard and three days of Hop on Hop off transport. Personally I think the Omnia Rome and Vatican Pass is slightly better value considering what you get, but of course it does depend on what attractions you want to see. I hope this helps – have a wonderful trip to Rome! One more question…. I clicked on your link to the coliseum….am I correct that I have to buy two separate tickets, One for the coliseum and another for the form and palatine Hill? My pleasure 🙂 The Coliseum ticket includes the Forum / Palatine Hill, so you only need to buy one ticket to get access to those attractions. Tickets are also valid for two days, although can only be used once for each attraction. Looks like a great itinerary, looking forward to checking it out. How about Rome after dark??? You could do this with three nights assuming you arrive early – you should do Day 3 first in that case as it’s less time sensitive, and then the other two days. If you can stretch to four nights though you will be less rushed in terms of having to arrive really early into Rome and possibly feeling tired, but up to you! Thank you for all the information. I will be taking my son for his graduation gift this June. I plan to follow almost all of your suggestions in regards to places to see. Having said that, what area do you suggest we stay at? I prefer to stay at a hotel. Any additional info would be appreciated. Have an amazing trip, and congratulations to your son! Thanks for this blog & itinerary. It seems this will help us so much on what to do in Rome exactly for our 4-5 days side trip from France. We are fed so much with the info. & some ideas or places to go. Is there also a local travel tour & guide to book for this 3 days tour in Rome? or better on our own & follow your guide. our concern, is how to go there to the places you have listed, i mean a ride , total cost or amount to spend or our estd budget amount, do we need a tour guide & is it easy to get a guide & not expensive?…We are our concern if we get lost , and how to proceed every places than having a tour guide…… if so,,, is it not too expensive …. what can you recommend if we will get a total package for the 3 days tour…. what agency …. or what is best can you advise/recommend. Thanks for your comment. I don’t know of any company that specifically offers this tour, but you could certainly put together a similar trip by putting various tours together. We like Walks of Italy (https://www.walksofitaly.com?tap_a=364-72eab1&tap_s=72513-efc32e) for their tours if you wanted a walking tour with a guide, but these aren’t private tours. That said, the itinerary is designed to be self-guided and you shouldn’t need a tour guide for any of it unless you would like local insight and guidance. The itinerary is also designed to be easy to follow and not require much other than a good pair of feet for walking. In some cases you can take a local bus, these are easy to use. Rome is not a very large city, or at least, not the parts covered in this itinerary, so I don’t think you will get lost or have any problem. The best idea is to get a map when you get to the city, and to download an offline version of the city into your Google Maps (or whatever mapping tool you use on your phone). Then you’ll always be able to figure out where you are and where to go. Just recently my brother and I visited Rome for three days and based our trip around the itinerary you guys did. I have to say this was the most convenient and awesome itinerary we found, in which showed all the attractions and sites clearly! All of the places you guys suggested in the blog we visited and also took the time to do some night roaming and visiting the attractions again to see it in a different light! Because of your blog, my brother and I were able to experience Rome as a whole and we give our massive thanks for it! SO once again, thank you soo much for this, you guys are amazing! We are so pleased that you found this itinerary useful, and even happier that you let us know! Getting comments like this really makes us happy – thank you so much! We’re delighted that you had a great trip, and that we were able to help with that! Happy travels!